I am not a religious woman, but I have witnessed one miracle in my life. Thirty years ago today, when the Mets were down to their final out, I was watching, four miles from Shea Stadium, in the borough of Queens. “It ain’t over til it’s over,” said the man I trusted most in the world. He was quoting Yogi Berra, but I didn’t know that. My dad howled his way through Mookie’s ten-pitch at-bat, tearing his hair at each foul ball. “Still alive!” my dad cried, as Mookie fouled it off again and again, one strike away from the end. It ain’t over til it’s over, I thought, righting the plastic helmet on my head. It slid backwards as I looked up at the screen. It ain’t over til it’s over. The tying run came home on a wild pitch. The crowd at Shea and the folks at home were on our feet. And then, with the count full, Mookie connected. I knew even I could field that grounder. It was bouncing down the first base line no faster than the ones my dad tapped me in the backyard. In the single second it traveled from Mookie’s bat toward Bucker’s glove, I concentrated the force of my will into one thought: NO. And my will was done. 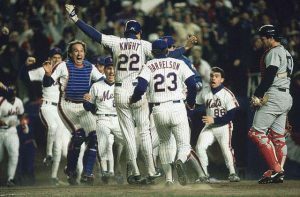 Buckner bungled, Mookie was safe, Ray Knight scored, and the Mets won. The “and” in that refrain has always seemed significant. Not just, “The Mets win!” but “And the Mets win!” As if to say, all this—this life, this world–and the Mets win. I went to bed that night believing that if I believed hard enough, I could make things happen with my mind. After that, our family played a game I called “Game 6,” in which we re-created the pile-on at home plate. Game 6, in our house, was shorthand for joy. I was raised with no religion. The atheists who performed the miracle of my life never mentioned the power of prayer. I discovered it by accident, like Albert Hoffman did with LSD. But faith found me, in what the film Bull Durham would call, the following year, “the church of baseball.” When I was a little girl, the one time I prayed for a miracle, it was delivered, instantly, and I have loved a long shot ever since. It took me many years to understand that the miracle I witnessed was someone else’s heartbreak, that the event itself was devoid of meaning. The New Englander friends I made later in life had to explain the blow to their own young lives for me to understand the Buddhist truths of emptiness as they pertained to Game 6. My last memory of Shea, the year before they tore it down, was a sign that simply said, “Amazing. Miracle. Magic. Believe”—an amalgam of Mets slogans of seasons past. And when I pray—and I do pray—that is my prayer. Amazing. Miracle. Magic. Believe. It ain’t over til it’s over, Amen. Mookie Wilson himself, who is a spiritual man, when asked if he thought divine intervention played a role in Game 6, answered, “No.” I know there are scientific explanations for most so-called miracles, that it was likely tides, not Moses, that parted the Red Sea. Bucker’s knees were creaky, his glove was floppy, his ankles shot to hell. But that is not what a seven-year-old knew, or saw. I hardly follow professional sports these days, but in all this time, I have not stopped believing. I live by the maxim that no matter how near the end may appear, as the Mets’ 1973 slogan exhorts, “Ya gotta believe.” Because one October night thirty seasons ago, a wise man said, “it ain’t over til it’s over,” and before my eyes, the Amazins made a prophet of my dad, and a believer out of me.